Woke up in the Oldtown district of Wichita with a tough forecast on our plate. Go north to Emporia, KS with a better probability of storms, or wait in Witchita, KS and points east with potential for more isolated supercells moving into higher θe later in the evening. Decided to stop and hang out at El Derado Lake State Park while watching towering cumulus to our NE (initial Emporia cells). Filled up with gas in Cassoday, KS ($4.06/gal! ; very high for the plains) after leaving the park while watching towers immediately to our W. Main tower was relatively mushy and orphaned several times. 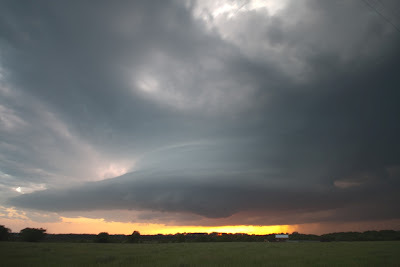 At this point, we had a sinking feeling inside, with several reports of a beautiful supercell and attendant tornado just outside of Topeka, KS. We decided to cut our losses and begin to head northeast on the KS turnpike. Just as we pull onto the turnpike, we began to notice signals of rapid strengthening (anvil knuckles/ radar echo tops). Unfortunately, we were now on the turnpike with no exits until emporia (figures). After backtracking to the storm, we were treated to a picturesque high-based supercell near El Derado. We then got back on the turnpike and paralleled the now looking multicelluar mess. Morphology of the storm through this next stage was rather interesting. Radar evolution suggests a split occurred, with two separate updraft echo tops. However, visually it almost appeared as if the "left split" was now beginning to slow and deviate to the right of the mean flow. This cell pulled a Pacman on the updraft to its southeast and merged into a beautiful bell-shaped monster. While it did not initially appear tornadic, Paul Sirvatka (CoD) noticed a small clear slot begin to cut from the west towards the location of the updraft (no great wall cloud or rotation was present at this time). We reported this via Spotter Network, and about 10 min. later a well-defined funnel began to form. We checked back in with the National Weather Service office in Topeka to let them know that a tornado appeared imminent. Tornado began to impact the outskirts of northeast Emporia and moved off into the countryside. We followed the storm to Reading, KS where we witnessed several power flashes and a new lightning illuminated elephant trunk tornado (we later found out that EF3 damage and 1 fatality occurred in Reading). The supercell had a beautiful bell-shaped appearance and was easy to see with some of the best lightning (anvil zits & CGs) I've ever seen. After this tornado occluded, Paul and I called off the "tornado" chase and hurried north on I-35 to get ahead of the storm (we had a hotel in KC in preparation for 5/22/11) to photograph lightning. A quick lightning pitstop near Wellsville, KS offered a "cherry on top" to a rollercoaster day. Met up with former adviser Walker Ashley and shared stories before calling it a night.